My ultimate list of the best drones for kids and beginners that are safe, durable and educational. Which one is on top of your wishlist? The number of these small popular radio-controlled flying machines on the market today is huge. It may be a daunting task to try and find the best drone for your kid, as a gift, or yourself if you want to learn flying a quadcopter. I have collected a list of my own favorites that I, and others, can safely recommend. Some of them have cameras, some are controlled with a remote, some have four blades, others have more… Read on, and I can almost guarantee you will find something you like. Drones are a cool gift for kids when they have a birthday or at Christmas. They don’t necessarily need to cost much. My favorite drone that gives you the best value for money is the Tello Ryze made in collaboration with DJI and Intel. Check out: DJI Tello Review – Is it the perfect beginner drone? There is no doubt that the blades and the weight of the device can hurt the pilot, people around, pets, and furniture. Naturally, the propellers on larger craft are more dangerous than smaller ones with small propellers and guards around. But it is still very easy to learn a kid how to fly a drone! Even 4-5-year-olds can fly nowadays contrary to back in the days where RC helicopters and planes needed years of training and skills. Many sites that write about drones for kids claim that the DJI Phantom and DJI Mavic series is an ok drone for kids. I mean that this drone is more suitable for adults and will not add this photo-drone to my list. This is a professional drone is which is heavy and can do a lot of damage if it drops from the sky or crash into things. It might be easier to fly Phantom drones than many of the smaller toy drones so in that aspect it is easy for a child to operate, but it doesn’t weigh up the dangers. All flying is dependent on adult supervision. Most manufacturers state in the manual that drones are not toys and set the age limit to 14 years +. For larger and powerful drones it is important to follow this advice, but for lighter crafts younger kids can perfectly use them – with supervision. In the list below, I have even included mini-drones for 4-year-olds, so everyone can begin with this fantastic hobby. The safest way of learning advanced drone flight for kids is with a simulator on PC. My suggestion here is the software called Liftoff and a remote controller like the Taranis QX7 you can hook up with a USB cable. That’s the setup I have myself. Then go for a small drone first before advancing to larger ones. They may be more difficult to fly, but the child will learn more. 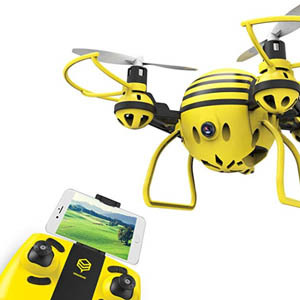 Now….. to the long list of 21 Best Drones for Kids and Beginners. Most of them are top rated products on Amazon and other stores by users. I’m sure your kid will have a lot of fun with one of these! Let me know in the comment section below which one you bought. 1. 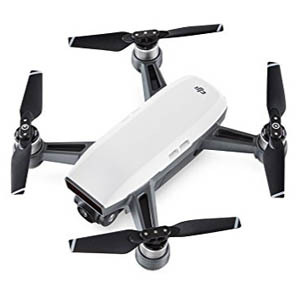 DJI Ryze Tello – Best value! DJI Ryze Tello is still on the top of my list of small and cool camera drones. It is made in collaboration with the well-known manufacturer DJI and Intel for the processing. The lightweight build quality is great, and it has sensors you rarely find in smaller quads like this. 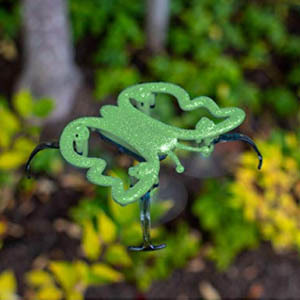 The Vision Positioning System allows it to hover precisely, take off easily and land safely in your hand. The propeller guards make it safer to fly inside if you bump into walls or other stuff. Fully charged you have 13 minutes of flight time which is impressive for a drone of this size. It is recommended to use it indoors, but I have used it outdoors in open spaces and when the weather is calm without problems. The small camera in front records 720p video or take 5MP pictures and you can control the unit up to 100 meters away. The cover on top can be changed with other colors. One fun and unique educational features with this drone are that it can be programmed to perform a row of tasks with Scratch for instance with an app called Droneblocks. Control: Smartphone or Bluetooth Controller bought separately. DJI Tello compatible remotes: Gamevice or GameSir T1d. Read my in-depth review here. Click the product image for direct link to an online store with updated price, more user reviews and more information. Recently DJI announced you can get the drone in Iron Man style as well. For another educational quadcopter, you can code, check out the Parrot Mambo in place 12. The SYMA X22W is a mini-drone with an HD camera that lets you or your kid see whatever the drone sees and take high-quality photos. 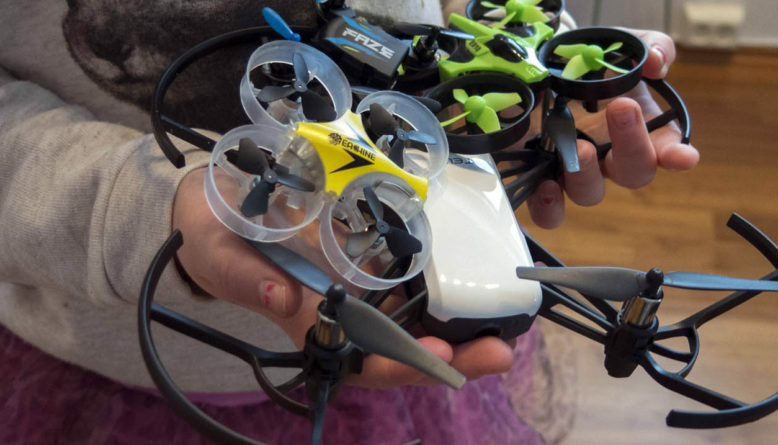 The manufacturer recommends this kid-friendly drone to 8-year-olds and up. The drone is controlled with a smartphone or remote controller. I always recommend using a controller with sticks and not the phone screen for navigation. On this drone however, you can draw a line on the screen and the aircraft will follow the path which is quite cool. Two batteries and a convenient battery charger are included, and they are easy to replace. Click the picture for more information. Also consider the X5C-1 further down this list. 3. Scoot Motion Hand Controlled Drone – For the smallest kids! 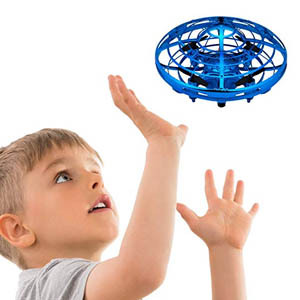 The Scoot hands-free drone is a cool indoor flying toy for kids and adults. This gadget does not have a remote but is solely controlled by hand movements. Just toss it in the air and it flies. It has high-tech motion- and infrared sensors that keep it away from obstacles and hands. This is how it is moved around – by using the hands as obstacles to move the unit! Surely a lot of fun! The shell, or cage, around makes it safe to fly and crash. It is fun for 4 and 5-year-olds as well as older children. Comes in three colors which are blue, red or silver. Click the picture for price and more interesting facts about this awesome little gadget. Also, check out the product under number 9 in the list which is a similar product. This is a bigger drone older kids and beginners. The Holy Stone HS200D has a 120-degree 720p camera for a great view and smooth video transmission to the smartphone on the controller. You can also use it with VR Glasses to enjoy the scenery – a good introduction to FVPV flying. It has altitude hold steady photography and easier controls or newbies. Flight time is estimated to be 10 minutes with the 1000mAh battery with a range of 100 meters. It can perform 3D flips so you can show off to friends. An alarm goes off when the battery level turns critical. 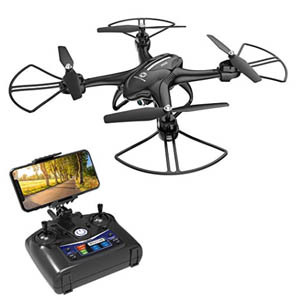 If you are curious about this cool quad and want more information and specs, click the picture for price and more user reviews. 5. DJI Spark – For the best quality. DJI Spark is an awesome high-quality quad made from a well-known quality manufacturer. You can’t go wrong with this one, but it is not recommended for smaller children. This quad is perfect for beginners in all ages or I you just want to have a small camera drone in your backpack when traveling. You can buy it in alpine white, green, blue and black or apply stickers for even more color combinations. 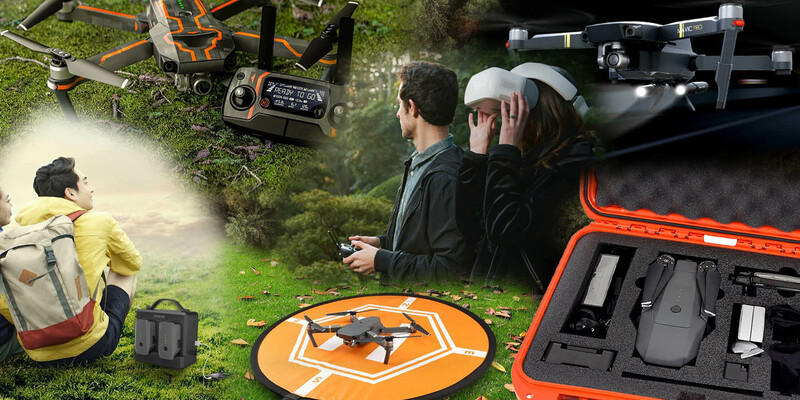 The quaddrone has FaceAware feature that lets you Quick Launch the drone from your hands. You can take amazing aerial photos by using hand gestures without other controllers. The drone lets you create cool aerial videos with easy by using intelligent flight modes and there are a ton of other cool features. Read more by clicking the image. Features: FaceAware, gesture controls, HD video transmission, perfect stability, and much more. Check the recent price on Amazon (shortcut link on the picture) or the official DJI Store. 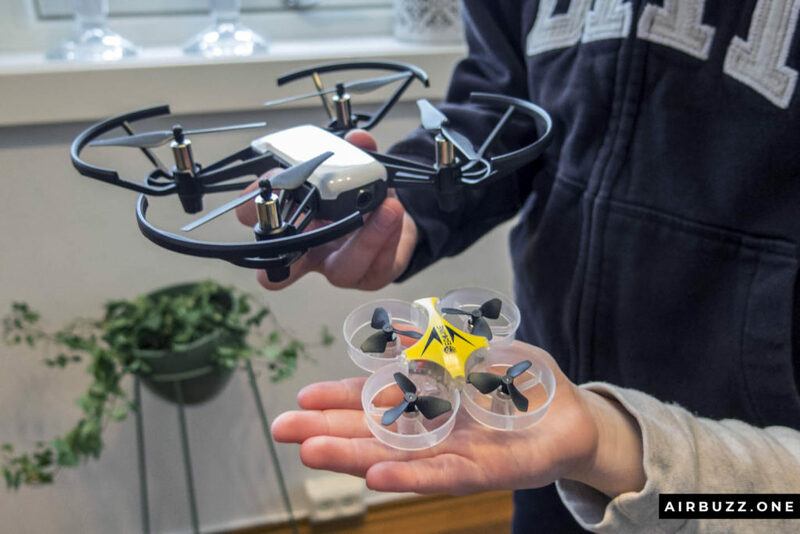 The Husbsan 2.4 GHz H107C+ is the perfect toy drone for kids and newbies. 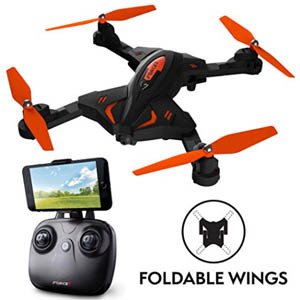 It can do flips and rolls, have a built-in 720p HD camera, headless mode, low power protection, altitude hold, built-in LED and is capable of outdoor flights. The lightweight machine is easy to fly for everyone with excellent durability and cool design. The package includes the drone, a remote control, a USB cable, propeller blades, battery and manual. Click on the image for more information and the price. This cool quad doesn’t cost a lot. 7. 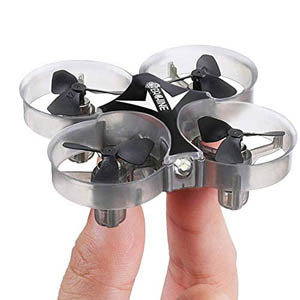 Eachine E012 Mini Drone – Indoor budget pick. The Eachine E012 mini quad is the descendant of the very popular and very cheap flying gadget named E010. This one is even smaller, does not cost much and have an even more sturdy frame and propellers with three blades. It comes in different versions with and without a camera. The cheapest edition has a LED light in front instead of the camera, but all versions have several colorful lights. You can choose between three flight speeds – start slow and increase as you’re getting better. It is super fun to fly this tiny craft around indoors. It is surprisingly stable and easy to maneuver around tight corners and flybys over furniture. It can also handle crashes well. Read more about it in my E012 review. It comes in black or yellow body color. It gets 5 of 5 stars on Amazon and gets tons of top user reviews. Link on the pic. 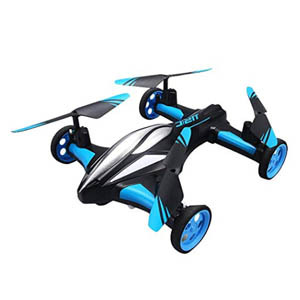 The JJRC H23 Flying Quadcopter Car is a combination of RC car and flying machine. It is equipped with the latest 6-axis flight control systems consisting of 3 accelerometers and 3 gyroscopes that makes it easy to fly both indoor and outdoor. The design ensures precise positioning and stability even if it is a little bit windy outside. It is controlled with the standard 2.4 GHz frequency which ensures powerful signals and stronger anti-interference performance if you fly near other drones. Comes in two colors: black and blue and black and yellow. Features: 360°rolling action, 3 speeds, LED lights, headless mode, return-to-home button, low battery alarm function. Let me know how this performs outdoors in windy conditions if you own one. 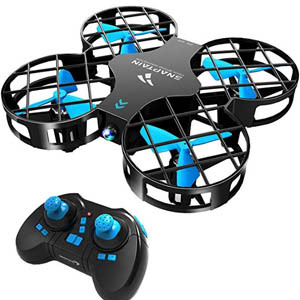 The Monarch Motion mini-drone formed as a butterfly is a very user friendly beginner drone for children and newbies. It comes in three sparkling colors: The Monarch Leaf is green, the Monarch Flame is pink, and the Monarch Wave is blue. It uses a unique one-hand palm controller that lets you steer the butterfly with just your hands. One-button for taking off and landing makes this thing very easy to fly. While in the air it can perform 360 flips and tricks, again controlled by your wrist and hand motions. Features: LED, 1 button liftoff and landing, Hand and arm motion sensors, auto hover, 6-axis gyro, 360 flips, headless mode. The Monarch kid friendly drone butterfly toy is easily one of the best tech gifts for boys, girls, kids, and adults. This one is a little bit similar to the product in place 3 in this list so check that one out too. 10. Force1 F111 Phoenix Live Video Drone – Great for teens. The F111 Phoenix from US-based Force1 is a pretty nice drone with foldable wings that is easy to stow away in the backpack. This kid-friendly quad has 6-axis gyro for stability and a 720p video camera for the perfect shot. It comes with a 2.4 GHz Transmitter with a phone mount. Live video is transmitted to a smartphone when flying so you can see exactly where you are and can frame the shot. Put on the propeller guards that come in the package for extra safety and take to the skies. The conclusion is that it is a great drone for kids, teenagers, and adults with lots of fun on board. Click the product image for more information and updated price. 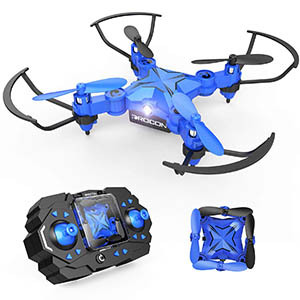 This gadget from DROCON is a travel-friendly toy drone that is easy to fly, charge and store in the accompanied remote controller. It has altitude hold mode that makes it hold its height when the stick is released many other cool features like High-speed spin. The device is either charged with the USB cable from an adapter or it can take power from the AAA batteries in the remote. I recommend the last option only in “emergencies”. Since the price is so low, this is a great gift for kids, teens, and tech-loving adults. 12. Parrot Mambo minidrone – With cool attachments! The new teen-friendly minidrones from Parrot are super cool and come in a few different versions even if the main drone is the same in all packages. What follows in the package depend on which version you buy, and the equipment can be attached on the top or clipped on elsewhere. When you own the drone, it is, of course, possible to buy all the extra stuff and accessories like the Cannon and Grabber later. The aircraft have advanced flight controller and high-performance sensors that make it easy to pilot and control. 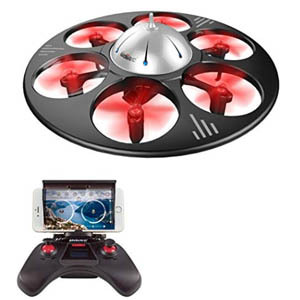 You can do fun acrobatics such as flips and barrel rolls and control it with either smartphone and the Free Flight Mini app or a remote. Parrot Mambo FLY: The basic package with the drone that lets you learn to fly. Vertical camera for snapshots. Accessories can be bought separately. 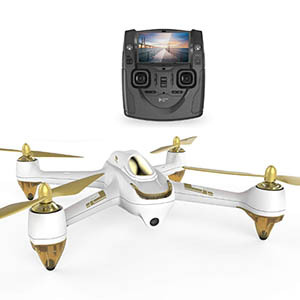 Parrot Mambo FPV: Perfect starter package for FPV pilots. Includes a 720p FPV camera and the Cockpitglasses 2. Parrot Mambo Mission: Includes the Cannon that shoots miniature balls up to 6ft away and the Grabber that can carry messages and cargo up to 4g. Parrot Mambo Code: Learn to code as you program your Parrot Mambo drone to avoid obstacles. Includes a 6-month subscription to Tynker. Features: 3-axis accelerometer and 3-axis gyroscope, ultrasound sensor, pressure sensor, camera sensor, Smart Block system. Also, remember my favorite the DJI Tello Drone in place 1 that looks a bit like the Parrot. The HUBSAN H501SS X4 is a sleek flying machine with an aerodynamic design, lightweight airframe, and brushless motors. It has a flight radius of 300 meters and airtime up to 20 meters. 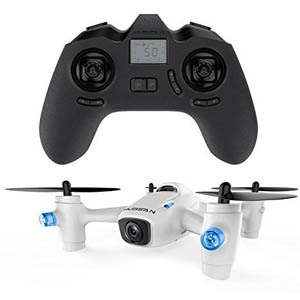 It is not the cheapest drone in this list, but it has advanced features like GPS positioning and 1080p HD camera worth every cent. Features: GPS Positioning, Follow Me mode, Headless mode, Altitude hold, Automatic return. It comes in white, as seen in the picture, and black. 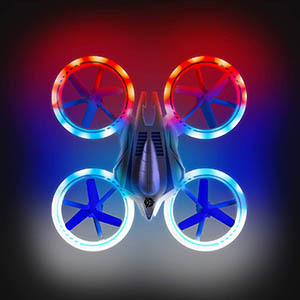 This cool glow in the dark flying machine called UFO 4000 LED drone has a sturdy frame and easy maneuverability. It’s not very big, but it has more LEDs than any other drone I’ve seen compared to its size. Fly indoor in a dark basement or outside in the garden at dark. Race and do tricks with friends with the same drone by changing the channels on the transmitter. Features: Headless mode, altitude hold, 360 flips, 1 key lift and land, vibrant LEDs. Check out more information and price by clicking the image. The U845 UFO drone by DBPower has a unique shape, formed as a circular UFO. It has more propellers than the usual drone too with six blades. It has an FPV camera underneath that lets you see where it is flying and lets you take great pictures. Since the device is circular it can be difficult to know which direction is forward, but the headless mode solves that. It orients the copters orientation on the controller instead of the “head”. It makes it easier to fly for newbies. It comes with a transmitter with a phone holder. Download the app for more control features. Features: Low battery alarm, headless mode, FPV camera. Wouldn’t it be ace to fly around with your own UFO? The Altair 818 Hornet is an awesome starter quadcopter designed for the beginner. One battery gives you 15 minutes of flight time which is decent for a product in this price range. It also comes with a spare battery in the box for twice as much fun. If you, or your kid, plan to take photos with it, 30 minutes gives you lots of time and opportunities. Its design is durable and stable with large landing feet, propeller guards, altitude hold and one button for taking off and landing. 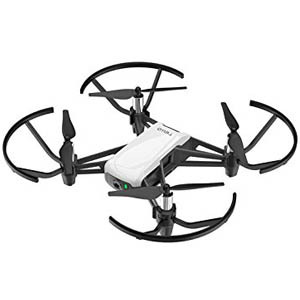 This is a very affordable drone with lots of features you find in more expensive products. It has a 120 degrees wide angled camera that transmits live video and pictures to an FPV headset, phone or tablet. If you want to start with FPV, this is a great way to try. The flight range is 150 meters. Features: 720p High Definition Camera, long battery time, altitude hold, 3 skill levels. 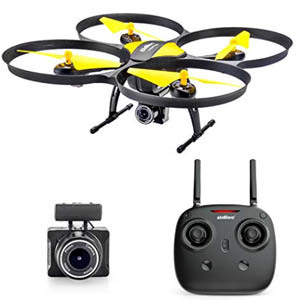 You get lots of droning fun for the money with this package. Click the image for even more cool information. 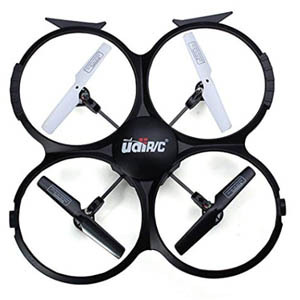 UDI U818A-HD is also a very affordable drone, but the battery time is not like the product above. It has the headless mode that is perfect for learning, a 6-axis flight control system, one key 360° continuous roll and more. It is equipped with a 1Mp HD video camera with 1280 x 720 resolution and 30 frames per second framerate. The frame is made from a highly elastic plastic protecting the blades from hitting stuff in a crash. You get an extra battery in the box, but I recommend buying more. One battery lasts for 6-10 minutes and needs 120 minutes to charge. Features: Low price, HD video camera, one button 360° roll, and continuous roll. A cheap quad, but not the most advanced. 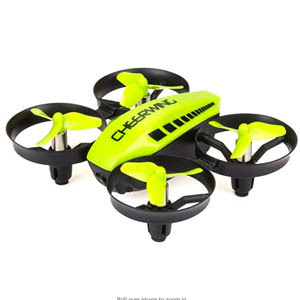 The Cheerwing CW10 is a mini-quadcopter suitable for kids. It has a built-in Wifi camera with a video stream to a mobile device. It can be controlled with either a remote control or by an app on a smartphone. The latter is only if you want to see the FPV video stream. I recommend using the controller when learning the skill of flying. It has advanced features like altitude hold mode, easy take-off and land, and planning of custom flight routes by drawing them on the screen. Comes in red or a yellowish/green color. Features: 15 m out of range alarm, live video, two ways to control, easy to fly, altitude hold, VR Headset Compatible. Cheap, funny, sturdy and very, very, cool. 19. SYMA X5C-1 – Great for beginners that want to learn flying! The X5C-1 Explorer from SYMA Toys is a good choice if you are looking for a drone with a unique look, and that is easy to fly for a decent price. 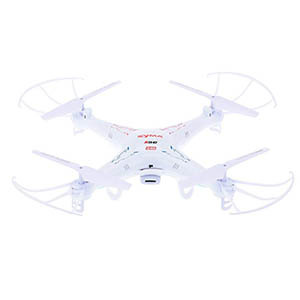 It is a great entry product to the hobby and according to reviewers on Amazon, it can handle a crash well. The unit is equipped with the latest 6-axis flight control systems and a high degree camera. It can take photos to an onboard SD card, but this is not an FPV. 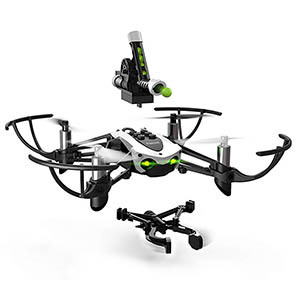 Just a great quadcopter for learning the art of droneflying! The SNAPTAIN H823H is a very cheap and affordable nano quadcopter for kids. The eye-catching design reveals a light flying machine with a sturdy frame that can handle a crash or hard landing. It is a perfect drone for young children. The small props are also well protected inside the cage. It can do 3D flips and rolls, have 3-speed levels and is capable of staying still in the air with altitude hold. The most distinct feature of this pocket-sized gadget is the very low price. It makes it perfect to give away as a gift. HASAKEE FPV Bee quad has a fun and unique, spherical, design in yellow and black colors that stand out from other similar units. It looks just like a bee which may be fun for younger kids. The bee has a built-in first person view camera for live HD video transfer and for capturing wonderful photos. It can be controlled with the accompanied remote controller, a smartphone or by gravity sensor. In gravity sensor mode you can control the drone simply by moving the phone in any direction. Turn the heat up with 3 speed modes when the kid have learned to fly. The remote has its own flip-up clip for mobile phones. Wow! 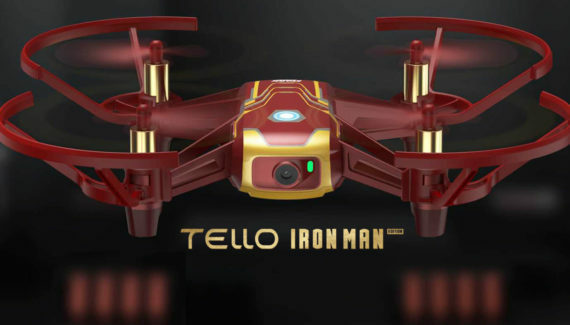 DJI has released the Tello Drone Iron Man Edition! Thanks Andreas for this secrets unleashed. This is an eye opener for drones lovers especially parents. Your reviews are well extracted because I had a little experience with DJI Ryze Tello which I got recently from a family friend. I am hoping to try the underlisted drones anytime sooner. Is there any disadvantage with respect to using drones for kids. Super awesome post. I’ve been really struggling to come up with a great gift for my nephew who’s turning six in April and I was skeptical about getting him a drone because it seemed dangerous. this list was very helpful. I am especially drawn to the Scoot Motion Hand Controlled drone, I love that it’s interactive rather than standing in the same position all the time and is probably a tad more fun than the others. I’m also considering the Force1 UFO 4000 LED Drone even though he’s below the recommended age, I think he will love this one and the LED lights add that extra fun factor to it. Wow! This is the best piece I have come across about drones. It is very explicit and detailed. My kid is a tech enthusiast and very much a drone lover. Though he is just 10years old but he knows a lot about drones and other technological advancements. I always thought drones are meant for highly skilled professionals who can prevent them from causing dangers. But this post has enlightened me well on how to stay safe while getting drone toys for my kid. I will get the DJI Ryze Tello to surprise him on his next birthday. All thanks to your posts enlightenment. Hi! Thanks for the awesome comment! The DJI Ryze Tello is a great and stable drone perfect for kids. I demonstrated it for a 13-year old a few weeks back and he loved it. Did you see that it also comes in a cool Iron Man version now? Hello, first and foremost I would like to say this is an interesting article and I think you have listed here the best of the best of drones anyone can recommend for a kid. The idea of flying a drone as always fantasized me and now I think I’m ready to get one from the list you have up there, one that’s suitable for both adults and kids. Cool! That’s great! Which one did you chose? Hi! Yes, it took a while. 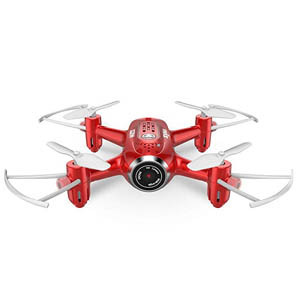 There are so many cool drones for beginners and children on the market. I used a lot of time investigating and trying out different products. I think my list truly shows the top drones on the marked in this genre. Wow! thanks for sharing this insightful review on drones for kids, I really appreciate you taking time and breaking it all down for us here. This is great. I don’t really know much when it comes to buying drone for kids but you have enlighten me more on that. Again, thanks for building this website and investing your time. It’s a great site. Wow, Andreas, the products you introduced are full of technology and very fashion ,and very suitable for children to play. My son is nearly 4 years old, and his toys will no longer satisfy enough. You are right that Scoot Motion Hand Controlled Drone is really suitable for the smallest children.I saw its 5 stars is 64% on the product page. I am going to choose this product you introduced as his birthday gift. Thanks for your recommendation. This is a very resourceful article. There is never a doubt one’s love for his kids will make him go all out finding fun stuff/toys to keep the kid happy especially during recreations. However, I held up that fear that my 10-year-old kid will get himself cut up or injured if I get a kid drone for him but this article just gave me good foresight on drones that are entirely safe for my kid. From the list of drones here, I really consider going for DJI Ryze Tello, Scoot Motion Hand Controlled Drone (For the smallest kids), and Parrot Mambo mini-drone ( With cool attachments). This is because of the compatibility I find in them. Thanks for this wonderful review. Hi! Yes, it is very important to be safe and the last thing we want is to hurt the kids. Rotating drone propellers can be dangerous. DJI Tello is a great choice. I showed it to a 13-year old kid last weekend and he loved the stability of it and how easy it was to operate. It also have propeller guards for increased safety. Hi! Thanks for the kind words! I always try to write my list posts as appealing to the readers as possible. I hope it makes it easier to scroll through the many drones for kids and make a choice. Hello and thank you for this amazing list. It really helped me. My little nephew is having his birthday very soon and he is all about airplanes. I think getting him a gift like this would be a perfect gift. From your list i think the best fit is Scoot Motion Controlled Drone. Its for his age and the fact that it is controllable by motion is what makes it even better. Thank you for the effort man. I am going to to Amazon and purchase this drone.